For many people in developing countries, farming is the foundation on which their lives depend. AgLinks Plus works to increase agricultural incomes by improving the competitiveness of Uzbekistan’s fruit and vegetable sector, a major driver of the Uzbek economy. We support farmers, agrifirms, processors, and other value chain participants. AgLinks Plus deepens and extends activities from the previous successful project that ran from 2007 to 2011. Analyze links between farms and markets—including seed, land, productivity, transport, storage, sales, and export—and identify ways to improve these links and upgrade agribusiness. Develop the capacity of local service providers to help farmers and ameliorate choke points between producers and buyers. Provide farmers with technical assistance and training to increase productivity and incomes. Help agroprocessing companies access new domestic, regional, and international markets and meet stringent market requirements and standards. 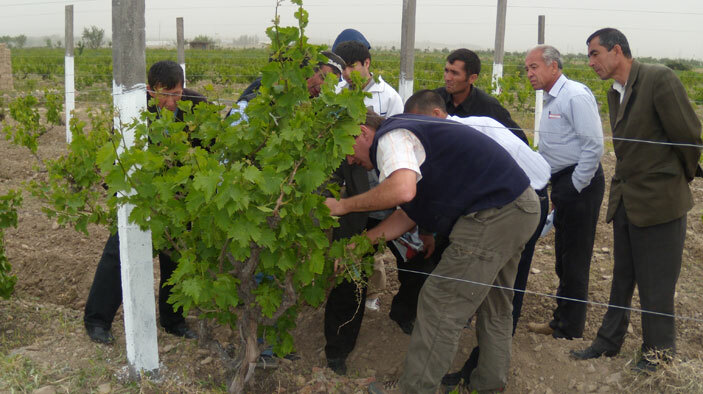 In the first project, AgLinks (2007—2011), Russian client signed an Uzbek agrifirm to a $7.9 million contract to supply fresh fruit and vegetables; a $1.4 million contract was facilitated for an agrifirm to supply dried vegetables and spices; and Uzbek-language farm manuals on pruning, thinning, grafting, and pest management were produced. Also in the first phase, the project procured information technology equipment for agrifirms; introduced trellising for grapes and apples; and built cold stores to hold fresh fruit and vegetables. Customized and installed drip irrigation systems in nine regions; introduced improved root stock material for plum, cherry, and peach; and identified and defined financing options with financial and agricultural actors to promote growth. Conducted a study tour to India for three partners in the research, grape farming and plant protection areas to observe the Indian technique with “Cold Dip” raisin production. Implemented a recurring Horticulture Exchange Program, designed to expose Uzbek agriculture professionals to training and experience in the United States. Designed, procured, and oversaw the installation of two advanced irrigation systems at Shreder branches in Tashkent and Ferghana.